In another life I taught High School Science. Biology was my specialty. One of the topics I presented was ‘water- it’s special properties’ something that all Biology students need to understand in order to study Biology at any level of Biology, be it biochemical or ecological. Safe to say this was not the most exciting topic for biology students, especially at the start of the semester but I endeavoured to make it as interesting and applicable as possible using some simple but very cool demonstrations that always captured student interest and helped make them appreciate the topic. 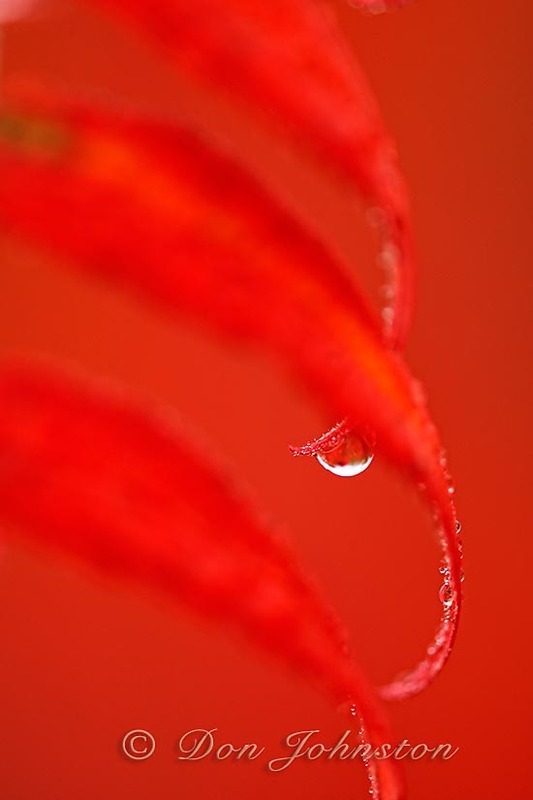 Raindrops cling to a garden flower stem. 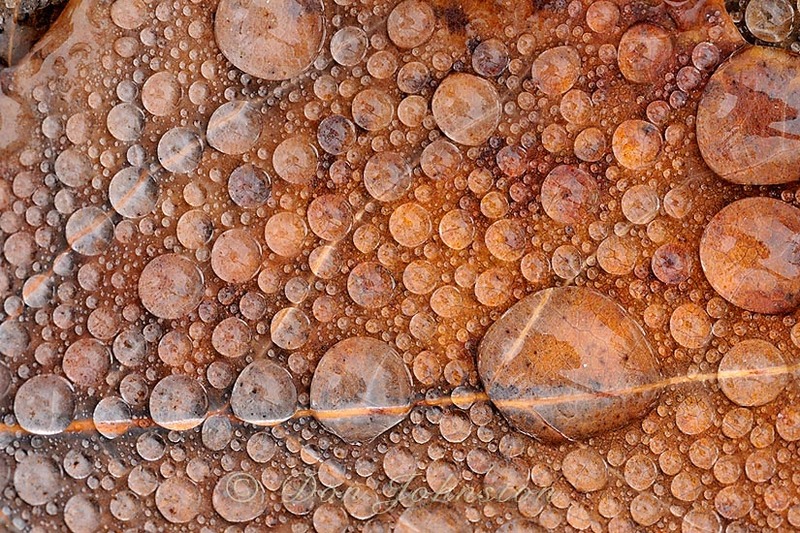 Water molecules are peculiar and one can demonstrate their fascinating nature by observing the behaviour of water drops. I sprinkled some water on a sheet of wax paper placed on an overhead projector. With a toothpick I towed water drops around on the slippery surface and the students could watch them merge when they got close together- always retaining their round shapes. Terms like hydrophobic and hydrophilic could be introduced. In another demonstration (which needs low humidity btw!) I combed my hair to put an electrostatic charge on the comb and then used it to attract a thin stream of water from the faucet. Living things take advantage of these peculiar properties in many ways and it was then my task to try and make those connections over the course of the semester. 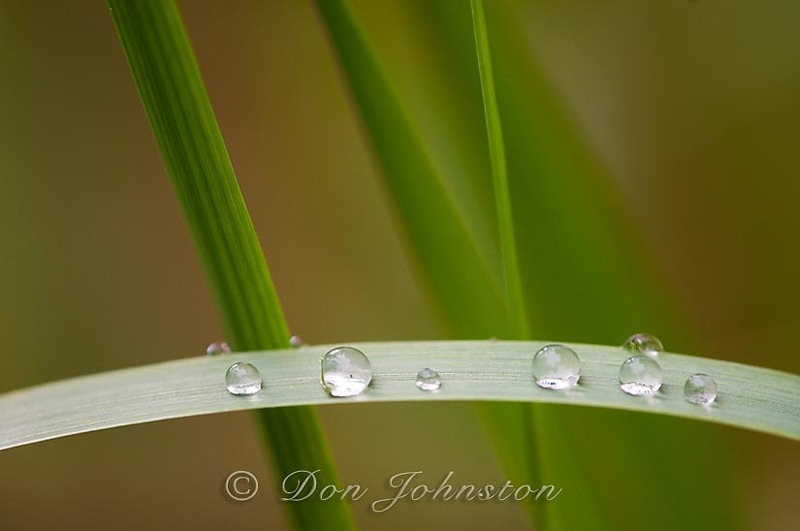 These days I am a photographer, but still fascinated by water drops clinging to stalks of grass, glistening on spider silk or beading up on the waxy surfaces of leaves. To photograph these phenomena I need a macro lens, tripod, calm conditions and preferably soft overcast light, but backlighting could work occasionally too. Shallow depths of field and careful framing are important factors to achieving success. Keywords such as ’round’, ‘fresh’, ‘delicate’, ‘reflections’, come to mind when photographing. I like soft backgrounds achieved by using shallow depths of field. 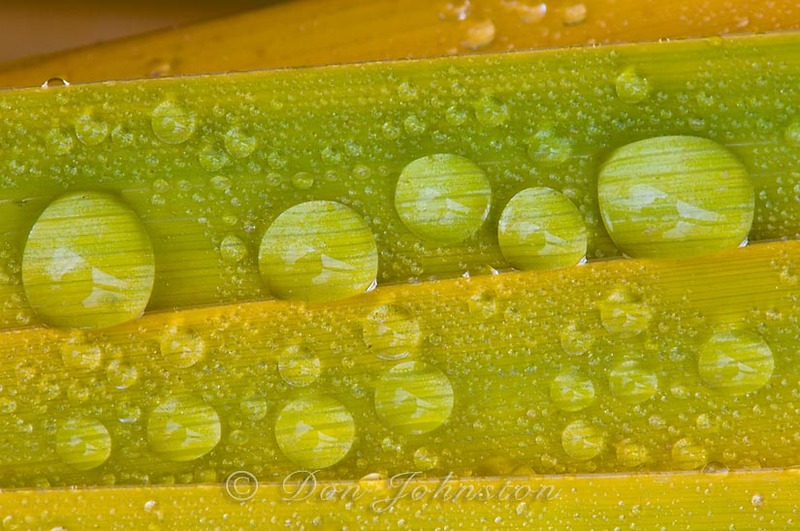 Keeping the raindrops in focus requires careful camera position, parallel to the main plane of the drops or sometimes I use Helicon focus stacking techniques to merge different areas of sharpness. After a light rain I hope for calm conditions and then venture out. Normally I do not need to go far. Brenda and I will be away for over a month, exploring the Northwest Territories to Wood Buffalo NP and up to Yellowknife, with another tour in to Arctic Haven Lodge in Nunavut included. I won’t be blogging until after I return but until then good shooting! 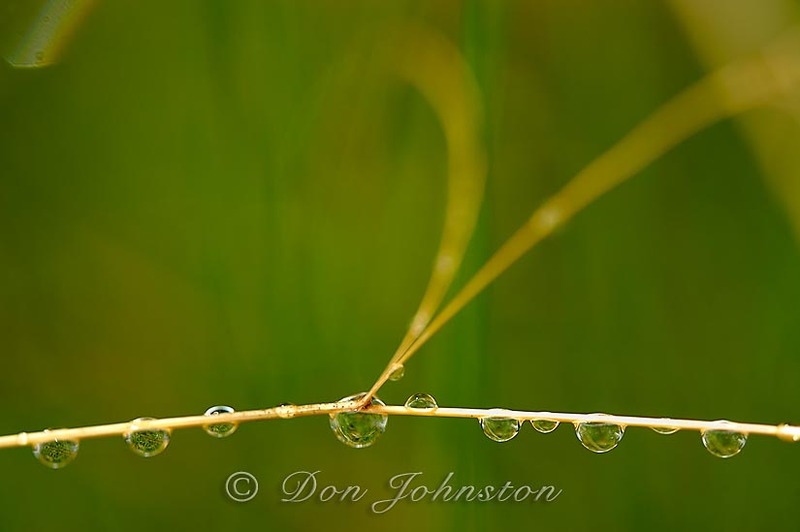 I (Don Johnston) am a wildlife and landscape photographer based in Lively, Northern Ontario. My work is represented by All Canada Photos (Victoria), agefotostock (Spain), Interphoto (Germany), PhotoEdit (USA) and Alamy (England). I am widely published in books, magazines, calendars as well as advertising media and decor. 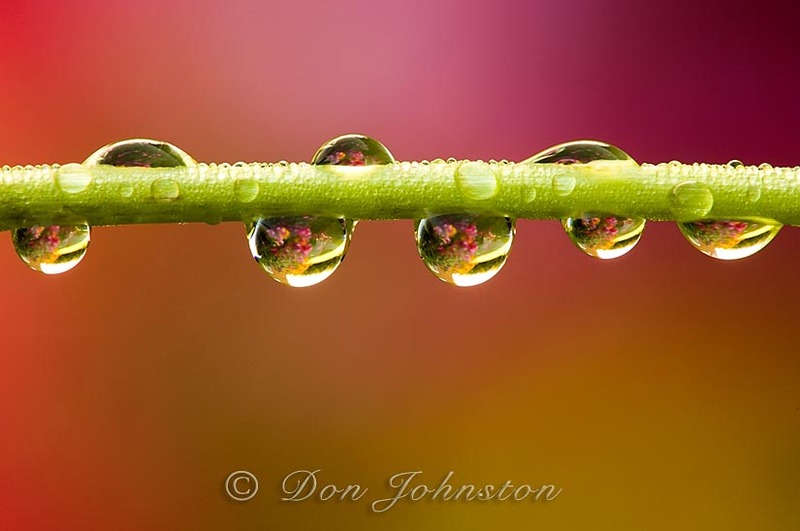 My personal stock photography website www.donjonstonphotos.com has over 10 000 images in galleries plus a search feature. Like many other nature photographers I am self-taught beginning with film in the 1980s and continuing through the 21st century with digital. 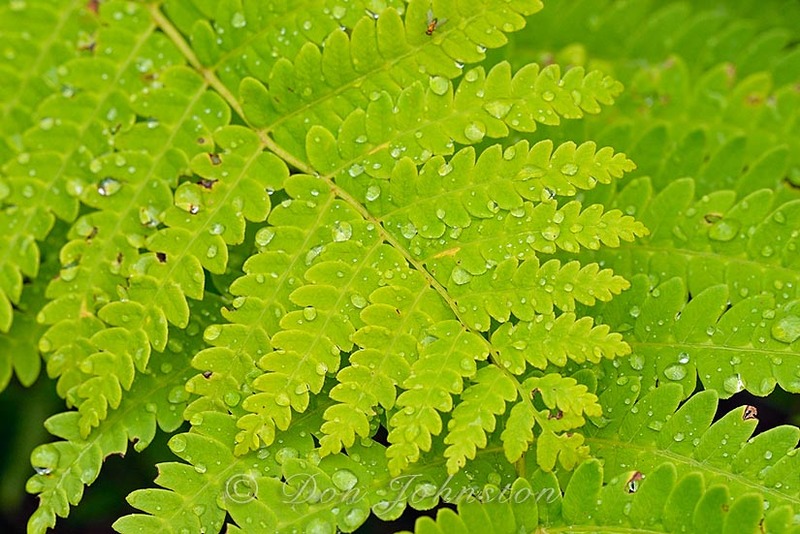 I taught high school biology for thirty years, retiring in 2003 to pursue photography full time. Beautiful work, Don. 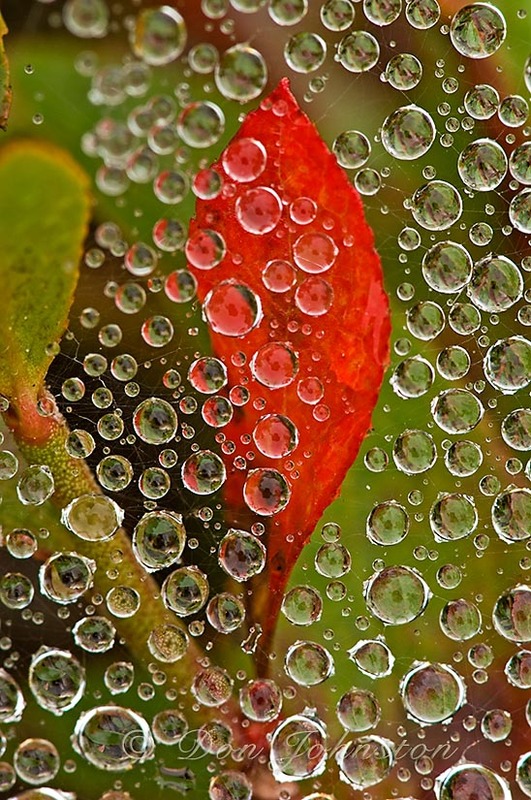 I love that we can see your beautiful flowers in the reflections in the drops in the second photo. Have a lovely trip! Hi Don, I was looking for some inspiration to get me away from my day to day wedding photography work and glad Google led me to you! That 2nd photo is simply fantastic, and certainly something that I will have to try and get out and do something similar. I’ve just spent 30 mins looking through your work and will certainly be back again to see what is going on. Thanks for the kind words. Stay dry in 2016! I learned the hard way that my D800E is not waterproof. A rainy day in Havana caused water damage, even though I was towelling it off from time to time.